Fermentation is used in a wide range of food and beverage applications, and the technology for enhancing this process is continually evolving. 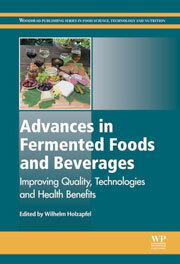 This book reviews the use of fermentation in foods and beverages and key aspects of fermented food production. Part one covers the health benefits of fermented foods. Part two includes chapters on fermentation microbiology, while part three looks at ways of controlling and monitoring the quality and safety of fermented foods. Part four covers advances in fermentation technology. Finally, part five covers particular fermented food products.